The world has heard far more inflammatory comments than Alex Ferguson's complaint that Bayern Munich acted like "typical Germans" during Manchester United's European Championship quarterfinal tie. 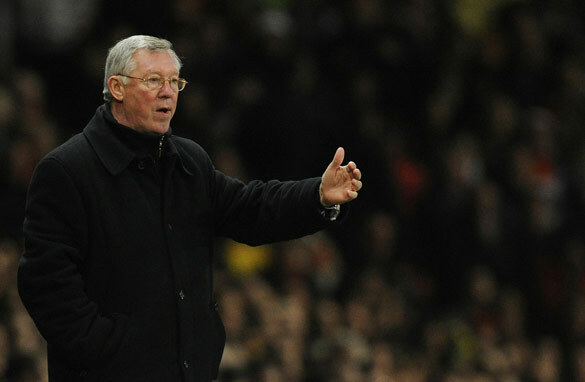 Alex Ferguson was enraged after Bayern Munich knocked Manchester United out of the European Champions League. But those two words – in the aftermath of winning at Old Trafford on Wednesday but going out of the competition on the away goals rule - reveal so much about Britain's most successful manager. It's impossible to explore the irony without dealing in tabloid cliche but Ferguson has never let anyone forget he's a Scotsman, despite working in the north-west of England for more than two decades. Some Scottish fans are famed for hating the English who, in turn, are traditionally ambivalent towards the Germans. If the old Chinese maxim was correct - that the enemy of my enemy is my friend - then Ferguson should find kinship with last night's victors. But alas, no. So has United's boss brought Britain together in a common dislike for the ability of German football teams to get the job done? Throw in the fact that Ferguson's main gripe was how Bayern Munich's players "surrounded the ref" and it's hard not to smile, especially given that the ref was surrounded by those well known Germans - Franck Ribery from France and Arjen Robben from Holland. I'd bet a lot of money that Manchester United would top a poll of football fans if they were asked which English Premier League team's players surround the referee most often. Just type "United," "Andy" and "D'urso" into a video sharing website to see how Ferguson's team are past masters at pressuring the match official. But let me backtrack just a little. Fergie can't really be accused of xenophobia considering how many players of different races and nationalities he's embraced at Old Trafford down the years. Not many of sport's great winners like losing, so it isn't a huge surprise that he sounded so bitter immediately after crashing out of the Champions League. Alex would dearly love to add another European title to his vast collection of trophies before retiring. Although he likes to give the impression of not caring what others, particularly the press, think of him Ferguson craves respect and admiration as much as the next person. He got his tactics against Bayern Munich spot on and you could argue that only Rafael's red card denied him another glorious night of vindication, proving that Alex Ferguson is just about the best in the business. Instead, the press was left to ruminate on another victory for the Germans against the English. And in that respect, Ferguson was right. Bayern Munich did act like "typical Germans." After all, they won. I am very happy about what happend yesterday despite the fact that i support one of the best team in England. I agree with you Alex. As a Liverpool fan I have seen Sir Ferguson and his team pressure match officials to give the result in their behalf, and whenever Man. U lose, Sir Ferguson always passes the blame to the match officials. There is hardly any game Man. U has lost where he has taken the blame himself or to his players. In his eye he is the best manager in the world and his players are the best in the world and they never make mistakes. "And in that respect, Ferguson was right. BayernMunich did act like "typical Germans". After all they won". And by that you mean the Germans always win?! P-u-l-e-a-s-e! I think the German were more resilent.They knew they were a better side and so they came off 3goals deficit like they did in their first leg. Well, let's not over-analyze Mr. Ferguson comments after his team failed to qualify for the final four in the champions league. I am sure he was very disappointed especially by the way ManU lost; they had complete control of the game but gave it away just before halftime. But you're spot on with your article. Brilliant article, as someone once said 'football is a very simple game, its 22 men running around for 90 minutes with the Germans winning at the end". Why has CNN started cramming soccer news into their front page lately? No one in the US cares about soccer! It's pretty obvious that CNN is pushing some sort of agenda here! This article doesn't make a lot of sense. Perhaps the way it is written. One way or another. Scottish v English? Brittish v German? "chinese maxim?" I'm not sure the point is. Reads in riddles. Did he think Man U didn't deserve to win? It was a great win for Bayern, can't fault them the slightest not even English - but another "victory for the Germans against the English." Has he watched the last few Champions Leagues? I'll give the next article a miss. Not sure he knows what he's writing. As a fan of MU and it's manager I am Increasingly being disillusioned by Mr Ferguson’s constant ‘it’s them against us’ attitude. I agree with your article entirely, Mr Ferguson is like any person who wants to be remembered for their achievements. But unfortunately Mr. Ferguson is now starting to be remembered as someone petulant, as is also starting to gather more enemies. This then leads to fewer fans and less profits, which at the end of the day is what footbat has become. I think Sir Alec should have said "typical Bayern Munich" and the vast majority of european football fans – germans included – would have heartily agreed with him. Bayern Munich is without doubt the most disliked club in Europe. Qualifying for the quarter-finals through an offside goal didn't help, and was one more example of "typical Bayern Munich". Germany vs England -> 1966. England won. Germany vs Italy -> 1982. Italy won. Germany vs Argentina -> 1986. Argentina won. Germany vs Brazil -> 2002. Brazil won. Real Madrid vs Ein. Frankfurt -> EC 1960. Real won. Liverpool vs B. Monchengladbach -> EC 1977. Liv'pool won. Nott. Forest vs Hamburger -> EC 1980. Nott won. Aston Villa vs Bayern -> EC 1982. Villa won. FC Porto vs Bayern -> EC 1987. Porto won. Man. U vs Bayern -> UCL 1999. epic win by the Red Devils. Real Madrid vs Bay. Leverkusen -> UCL 2002. Real won. English Teams + National team 5 x 1 German Teams + National Team. If MU or rather W.U. (women united) is not sporting enough to lose gracefully,how then can it ever win? Don't give me poor refreeing,injury to "stars" if there is any etc,etc. You lost and you are out!! ManUtd never allowed the German side into the game at start, really,they never did and the result was evident when the hosts recorded two early goals and third later in the first half. The visitors came back just before half time and that was good for the side to move on and hence the result. The point is not about what he said..The nature of the game was such that referee could, simply, not get influenced by Bayern Players. I mean, he was about to let go but when surrounded by players, he took out his red card. Simply unacceptable. Manchester United are one team that progress not on individual brilliance but only because they are a good TEAM....Anyways, Ferguson is the best there is and he is dead right. Honestly the centre referee had given unfair advantage to the german club(bayern munich) considering the fact that vaan bomel was to have been given red card but the grossly incompetent referee overlooked that. Thus i'll uefa authorities to fine the ref. for being unjust to manutd. Yeah, Robben and Ribéry are notorious Germans, aren't they? Funny how SAF seems to forget the rules of the game whenever he loses. Pulling on the jersey is a yellow card offense – you already have one of those, then do the math. There is no 'But' clause there. Yellow+Yellow =Getting sent off. Simple. Clearly people who provide stats to support the fact that Germans don't always win don't understand the spirit it was said in at all...Or has much of a sense of humor! since 1968, germany has won 12 of 19 versus england and tied twice. Meaning england has only won 5 times against germany in over 40 years. And for the record, brazil? Don't pretend like they're the best nowadays, i see that they were only a point in front of chile for the world cup qualifiers, and 2 ahead of paraguay, teams that are ranked 13 and 23 (in the world) respectively, how can you consider them to be great? I fully agree with you. Ferguson is bitter, and the comment "typical Germans" is blatantly out of order. First of, and as you mentioned, Ribery and Robben surrounding the ref are.....french and dutch. Secondly, Van Buyten and Van Bommel were the ones who tackled Rooney. One is Belgian, the other Dutch. Lastly, what are the nationalities of the scorers? Olic and Robben? Typical Germans he said? Now, ManUtd lost and it's unfortunate for them. However, it's not showing class and respect to play on senseless stereotypes and prejudices. Bayern Munich is peaking at the right time. Their top players are in form and free from injuries. Bouncing back even when a few goals down is less difficult for such seasoned outfits. Congratulations to the winners. Is he suggesting that Germany's best team doesn't belong in the quarter finals. Don't forget that they beat Man U in Munich so its no fluke that they advanced at ManU's expense. Sorry... are we talking about the same sport? England qualified in a group with Ukraine and Croatia (as the contenders)... how many world titles on it? 1... 1966. Germany qualified in a group with Russia... and... Russia? I would love to see Germany and England failing at the qualifying if they played in South America's Qualifiers. Sorry Timaay, when your national team got 5 stars talk to me... otherwise everything you say is just rubbish. Julius Bokoru, I think the exact same thing. I think man-u would have done better if rooney had played that match though we all know that the ref did a very bad work that day, the fact is that its all past now and i can assure you that manchester united remains. MAN UTD AND THEIR COACHES?, STAFF FANS ALL OVER THE WORLD SHOULD THAT DEFENT IN GOOD FAITH. NO THE OTHER WAY ROUND. Mr. Thomas, I respect your reporting, but I feel the emotion of this article has way too much of a one-sided opinion. Even though I am a Man U fan, and I would have loved to see them go through, it was nice to watch the match, and I am not disappointed at all at the outcome. The paragraph below is completely biased. "Just type "United," "Andy" and "D'urso" into a video sharing website to see how Ferguson's team are past masters at pressuring the match official." "But let me backtrack just a little. Fergie can't really be accused of xenophobia considering how many players of different races and nationalities he's embraced at Old Trafford down the years. Not many of sport's great winners like losing, so it isn't a huge surprise that he sounded so bitter immediately after crashing out of the Champions League." It's disappointing to read such a biased article from CNN. I respect your reporting Mr. Thomas, but I feel that this is a rubbish article. And the away goal is just ridiculous! But the one in Munich and at the Old Trafford were excellent games. Plus, LoveBritsOverGermans, your comment is precisely correct.